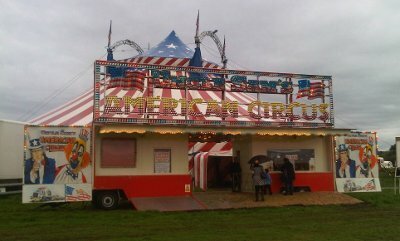 I’ve not really been to many circuses before so didn’t really know what to expect when Uncle Sam’s Great American Circus came to Redditch. I’ve seen a couple of shows before at Blackpool Tower and Circus Circus hotel in Las Vegas, but if I have ever been to a circus in a big top tent then it will have been when I was very young. We bought tickets for the first show which were much cheaper than the other days. There was not many people there on the first night, although the heavy rain storm probably didn’t help either. At the 5pm Weds show most of the ring-side seats were taken but few of the tiered seats. I suspect the weekends are much busier, but you can probably just turn up and buy tickets on entry for the weekday shows (cash and cheque only – no cards). There are special 50% off coupons which I expect almost everyone uses. They are available in the local papers or online on the circus website or the circus facebook page. I think for most shows seats are allocated on the tickets, but on the first night seats are not allocated and it’s a case of turn up early for the good ringside seats. The ringside seats have the added “advantage” of being in firing distance of the clowns and the risk of being made a part of the clown act (as I was twice). The show was great. There was a lot of different acts as you would expect from clowns to motorbikes with some trapeze artists and illusionists (magicians). Some of the acts were very impressive. The show lasted for about an hour and a half plus an interval with the regular clown fillers whilst the equipment was changed for the next act. My favourite act was the final one called the wheels of death. It is a bit difficult to describe. It involved two artists on what looked like giant hamster wheels on a giant revolving arm which swung them to within a foot of the floor of the tent to within a foot of the top of the tent. My two year old son enjoyed the characters and the clowns. My five year old daughter takes great pleasure in saying that her favourite bit was daddy getting a bucket full of popcorn thrown over his head by the clown. Some of the artists were selling souvenirs before the start and during the interval. This includes spinning plates which they spent a bit of time trying to teach me how to spin. I did dreadful, but others seam to grasp it much better than me. They were very patient with me though. We had a great time – I’d certainly recommend it was a fun family event. This entry was posted on Wednesday, September 29th, 2010 and is filed under Children, Days Out, Family, Redditch Worcestershire. You can follow any responses to this entry through the RSS 2.0 feed. Both comments and pings are currently closed.